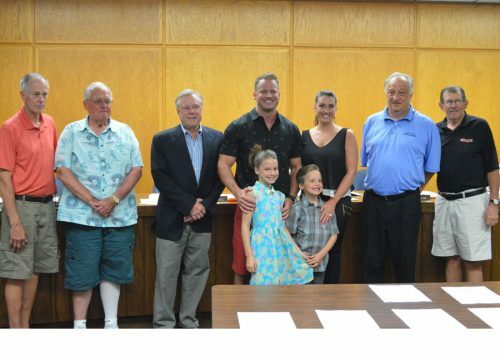 Shown are members of the Syracuse Town Council and the Johns family during the council’s monthly meeting Tuesday nigh. From left are Councilman Paul Stoelting, Council President Tom Hoover, Councilman Larry Siegel, Dustin Johns, Lindsay Johns, Dylan Johns and Bailey Johns, Town Manager Henry DeJulia and Councilman Bill Musser. SYRACUSE — Syracuse Town Council approved two economic development agreements for the purchase of seven lots in the Syracuse Technology Park during its monthly meeting Tuesday night, May 16. “It was really easy working with each other,” said Dustin Johns, owner of Innovation Inc. and Travel Lite RV. “That area needed something to bring it to life.” Johns also said he is excited to get started with construction and he’s waiting for a few more bids to come in. The council held a public hearing for annexation of the technical park into Syracuse from Elkhart County. With no comments from the public, the council closed the hearing. The council also approved a fiscal policy for annexing the technology park. The council approved a tax abatement report finding Precision Automotive in compliance with its tax abatement. Mark Jesse and Jeremy Hardy of Commonwealth Engineers came before the council recommending the council apply for a Crossroads Matching Grant which could potentially cover 75 percent of the town’s road paving. Commonwealth would do the preliminary work for the grant for a $25,000 fee. The call for projects is expected in July with the Indiana Department of Transportation granting awards in August. The grant would cover paving, sidewalks, ADA ramps as well as curbs and drainage issues. Town Manager Henry DeJulia noted the grant could also be used for asphalt and the Harkless Road storm water issue. After discussion the council approved hiring Commonwealth to do the preliminary work. The council hired Commonwealth Engineers to do the preliminary work on a wastewater permit renewal. The permit needs to be renewed every five years and is due next year. However, Syracuse needs to apply for the permit renewal six months before the current permit expires. Cost of having Commonwealth do the work is not to exceed $10,000. Robin Merchant, public works superintendent, is still working on getting information regarding new aeration equipment. The information provided by Triad Engineering was incorrect according to the Indiana Department of Environmental Management. An engineer from the equipment manufacturer will be at the site in the next week or so to see what needs to be done. Merchant reported the booster station near the technology park is not working as it should. There is a programming issue and debris causing problems. Council approved purchasing a new dump truck from W.A. Jones for $142,707 and a leasing a new vac truck for $47,122 covering seven years for a total cost of $329,854 from Best Equipment. The truck will have a one-year warranty on the truck and a five-year or lifetime warranty on parts. Fire Chief Mickey Scott reported bids for the vacuum tanker are to be turned in by June 9. The aerial truck is back in service. The council approved purchasing four air packs and eight face masks for $29,513.50. The fire department will have a pancake and sausage breakfast from 7 to 11 a.m. Saturday, June 3. Proceeds will go for a retired firefighter with medical bills. Chris Lee from Jackie Walorski’s office introduced himself. He is in the Syracuse Town Hall once a month. He noted his schedule is changing but those interested in visiting with him can check walorski.house.gov for his schedule.